An electrical estimate often has light fixtures included. 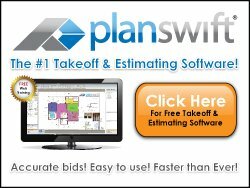 Good electrical estimating software has a catalog of light fixtures to select from to prepare a bid quickly and efficiently. Below are important considerations regarding lighting. Take off light fixtures and lamps - The fixture schedule is displayed on the drawings and lists all light fixtures types included in the project. Letters and numbers are used to designate fixture types, like Fixture Type 'A", Fixture Type 'B', or Fixture Type 'A1' etc. The lighting drawings show the fixture layout. The lighting take off is done from the lighting drawings. 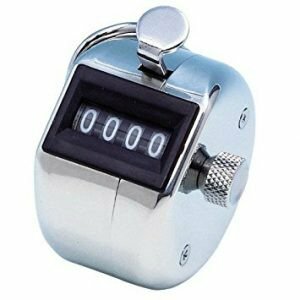 Tally Counter. Make sure to highlight the fixtures as you count them. Copy and print the fixture schedule. Count each fixture type and write the total quantity of each fixture type on the fixture schedule. Send the fixture schedule with quantities to your supplier for a quote. If a fixture type is not clear or not labeled, look in adjacent room or area and see if it is logical that it is the same type. If it is not clear what type they are then circle the item with a question mark and send an RFI or use other means to determine what it is. DO NOT LEAVE IT OUT! List it down with a description as an unknown. Plug a price for this if you cannot determine what it is. This information will be essential when it comes down to entering light fixture details in your electrical estimating software. Check your work - After you have counted, and written down all the light fixtures, make another visual pass over the drawings to find any fixtures you may have overlooked. Look for any additional lighting accessories or supports needed and list them (i.e. strut supports, other structural supports, seismic wires, pendants, and hooks. Look closely for emergency batteries or dimming ballasts that are required but not shown on the fixture schedule. They may be required by obscure notes on the plans. Tip - Look for exit lights, they are the most likely to be missed. Remember to call your lighting suppliers to request a fixture quote with plenty of time in advance.